Book Review – Left for Dead by Nick Ward, the 1979 Fastnet Race and one man’s epic story of survival. This book review – Left for Dead by Nick Ward, tells the account of one crewman who survived the Fastnet Race of 1979, in quite appalling weather conditions. The interest comes from the fact that six started out on the Nicholson Yacht Grimalkin and four survived. Three having left two crew behind on the yacht, when they launched the life raft and the sixth, the skipper, having been washed away presumed drowned. So you now have two crew “left for dead”. A book like this can be reviewed at many levels and a simple Google search will source untold reviews and subsequent comments, not all supportive, so what can I add? The book was well reviewed and went on to be listed for literary prizes, not a complete dud. As a yacht person with a Nicholson, I have a keen interest but do read this book for the human interest. The story is well told, gripping even, and carries you along so I read it in less than a day. The opening is gentle and the detail of the storm vivid. Nick Ward the surviving author, made notes in his hospital bed and I thought the account was brilliantly written even after 25 years, freshness coming from those notes, we hope. Although it is Nick telling his story, with his honesty, there is another side to this story from the crew that left him for dead! The writing style means you are on the boat, with the chaos aboard, the resilience of Nick, the near death experience and it’s very uncomfortable. Nick raised his demons and writes about them, has about twenty hours of being bounced around in a sinking yacht with a dead friend to talk to, to imagine all sorts of hostility to his life raft escapees. We can imagine his loneliness, we can also stop and think about how we would cope. What we learn is that the demons are not really resolved, that others recalled events in other ways. The crew included young men in an era when Post Traumatic Stress Disorder was not as commonly mentioned as it is today. I think we get a rare insight into the human mind, frailty and strength in this book. Oh and it’s a sort of love story as Nick’s wife is his rock, not the Fastnet. Now to tie down my floorboards, put the can opener on a string and make sure I have an emergency VHF aerial! A Great read in my book. Book Review – Left for Dead by Nick Ward was reviewed by Lovesail member Flushing. Lovesail is on on-line dating and social networking site where sailing enthusiasts from around the world can meet to arrange sailing dates or sailing trips. The Fastnet Race 2013 sees a record number of entries, 347. Last year saw 315 entries. There is a strong female entry this year with many high profile women sailors leaving from Cowes on 11th August in the world’s largest offshore race, the Fastnet Race 2013. First up is Dona Bertarelli, co-skipper of Spindrift 2, the 40ft trimaran “This race is a big challenge for me and for the Spindrift racing team as a whole, not only because of its historical importance, but for several other reasons,” explains Bertarelli, who has spent the last years campaigning the D35 catamaran Ladycat in Switzerland. “The Rolex Fastnet Race will be my first offshore experience, but it will also be our first race with Spindrift 2. We are competitors and even though we will have had little time to train, to get to know the boat and build a strong sailing team, our objective remain to win”. Second up is Team SCA, competing in the Fastnet Race 2013 as part of the Volvo Ocean Race’s best ever all-female campaign. For the Fastnet this will comprise multiple Volvo Ocean Race winner Brad Jackson, Joca Signorini and Spanish bowman Pepe Ribes. Among the British crew is Vendee Globe skipper Sam Davies and Olympic match racer Annie Lush, two of the five women already selected for the team. Lastly but not least, another all-female team led by Lucy Reynolds has entered the First 40, Southern Child. “One of our regular crew asked if I’d be interested in doing an all-female campaign and I went ‘why not? '” says Lucy of how this came about. The crew of Southern Child is mostly paying guests. “One of our crew has done the race before and another has done the ARC and various transatlantic and offshore passage, so it is a mixed level of experience, and we have a couple coming in from the States,” says Lucy. The Fastnet Race 2013 will leave the Royal Yacht Squadron line off Cowes, Isle of Wight on Sunday 11th August. Scheduled to leave between 10 and 2, best viewing points in Cowes will be Cowes Green and Egypt Esplanade. Other good viewing points will be Yarmouth, Isle of Wight and Hurst Castle near Lymington, Hampshire. What is the Fastnet Race? The Rolex Fastnet Race will be starting from Cowes tomorrow (14th August 2011 11:00). Just when I thought I wouldn’t be seeing the Isle of Wight for some time after Cowes Week. The Fastnet Race is a UK offshore yachting race which was founded in 1925 by keen Yachtman, writer and broadcaster, Weston Martyr. He had competed in yachting races in Bermuda and wanted a set up a similar race in Britain. 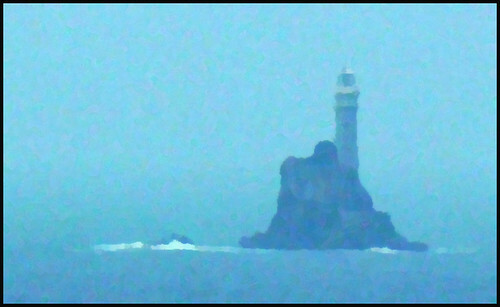 It is called the Fastnet Race because of the route taken by the yachts. They leave from Cowes, Isle of Wight, pass Lands End and head for Fastnet Rock (off the southwest coast of Ireland. They round the rock then return passing Bishop’s Rock lighthouse on the Isles of Scilly to end the race in Plymouth. This year’s 44th edition will see a total of 608 nautical miles sailed by a record 350 yachts from 19 countries. The first of the winners should start arriving on the morning of the 16th (Tuesday) with the rest of the fleet arriving over the week. The current course record is 1 day, 20 hours and 18 minutes. The winners receive the Fastnet Challenge Cup and this is awarded to the yacht with the fastest race time. This is calculated using the IRC handicap. This is a rating rule to handicap different designs of keelboats allowing them to race together. Each boat’s rating (her ‘handicap’) is calculated using measurements of the boat; her length, weight, draft, sail area, etc. The resulting time corrector, the boat’s ‘TCC’, is her handicap. After a race, each boat’s elapsed time (the time she has taken to complete the course) is multiplied by her TCC to calculate her corrected time (her race time making allowance for the characteristics of the boat). The boat with the shortest corrected time is the winner of the race. This year 300 boats will be eligible to win the Challenge Cup.